A few months ago, I went over a couple tips for protecting your retro game collection. But I wanted to do a brief post about how to specifically approach protecting your NES collection. Once more, the objective is to keep your assets safe from scratching, bending, light damage and air or water deterioration. NES games are particularly vulnerable to these elements for a number of reasons– they’re stored outside of protective cases, they’re old and made of plastic, they have fragile labels and they’re frequently stacked. How you approach protecting your collection depends on a handful of variables. When you begin to develop a protection strategy, ask yourself a few questions: How long do you intend to keep your collection? How many valuable games do you own or plan to own in the near future? And how likely are your games to be damaged in the near future? The longer you plan to own your games and the more valuable the games you own, the more time and resources you should commit to keeping them in their current condition. Additionally, other threats such as children, shifty shelving, flood or earthquakes and direct sunlight heighten your risk for game damage. 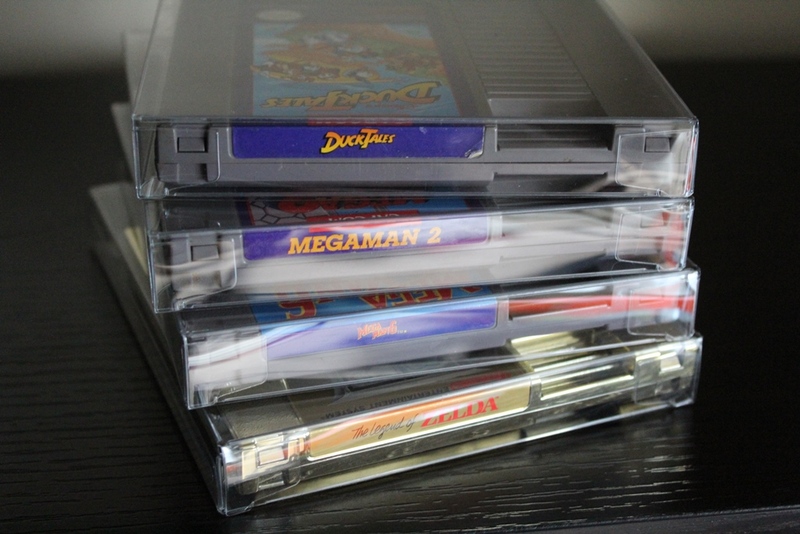 Shelving: Always avoid stacking games on top of each other, which can break the cartridges and damage the label. Always try to shelve them on their sides to minimize pressure on the games. Even if you’re storing them in a temporary location, consider building your own shelves with two by fours. Check out YouTube tutorials on how to create them cheaply and in little time. Investing in box protectors: This can be tricky. I only collect cartridges (not boxes or manuals) and I intend to continue collecting for at least five more years or until I complete my NES collection. So I generally purchase 100 cartridge protectors at a time. I use them on any game worth more than $25. As some of the games become more valuable, I’ll need to box those as well. Protecting boxed NES games: NES boxes are hard to come by these days, especially since most kids threw theirs away when they first opened their games. And since they’re also rather fragile and highly collectible, it makes financial sense to spend the money to protect them from bending and creasing. 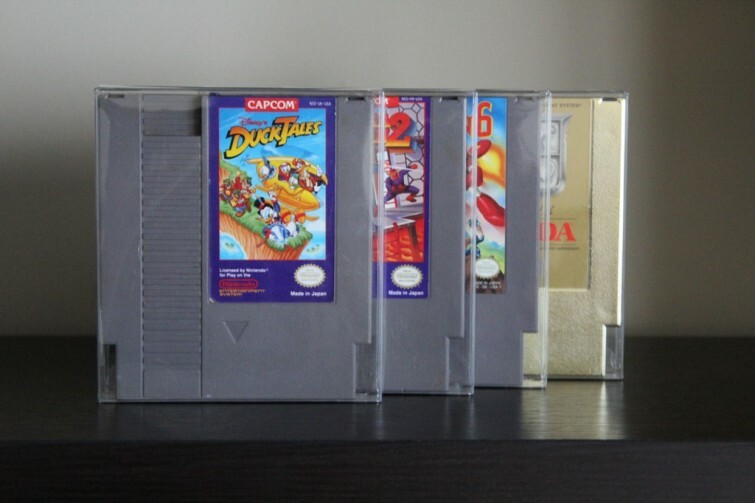 Personally, if I collected NES boxes, I would buy enough protectors for all of them. I didn’t want to reiterate some of the more broad protection tips featured in my previous post. So if you’re looking for more information on this topic, be sure to check out our other collecting tips. For the rest of the entries of NES Quest, check them out right here on Retro Chronicle.